When I first found out that Shiseido had a new sunscreen, a shiver went through me. Partly in anticipation, partly in fear. If they do the unthinkable, and discontinue or mess up the formulation for the Perfect UV Protector sunscreen, I swear, I will throw a fit! As many of you know by now, it’s the only sunscreen I will wear and repurchase, even if my wallet cries in protest. Happily therefore, when the new Shiseido Perfect UV Protector Hydrofresh SPF50+ PA++++ sunscreen landed on my desk, I found I could heave a sigh of relief. This does not replace the one I love (with the orange trim) but is an extension of the Perfect UV Protector range. What some people have reported to me, when they tried my holy grail sunscreen, was that they found it a bit drying. Now, I personally don’t, but I can understand why some people may find it to be so. 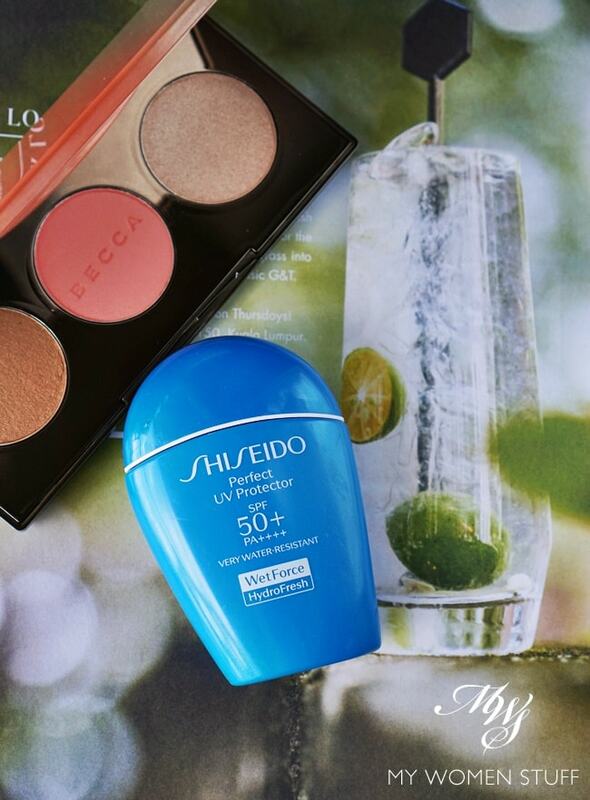 This then, is Shiseido’s answer – the Shiseido Perfect UV Protector Hydrofresh. The Shiseido Perfect UV Protector Hydrofresh shares many similar characteristics with its older sibling in the same range. It boasts a very high, broad-spectrum UV protection, with SPF50+ and PA++++ protection against UVB and UVA rays, respectively. Now, I know there are people who scoff at SPF50 sunscreens, and I say hey, you’re entitled to your opinion 🙂 Me, I go for a minimum sun protection factor of 50. No SPF50, I won’t touch it. But that’s me. 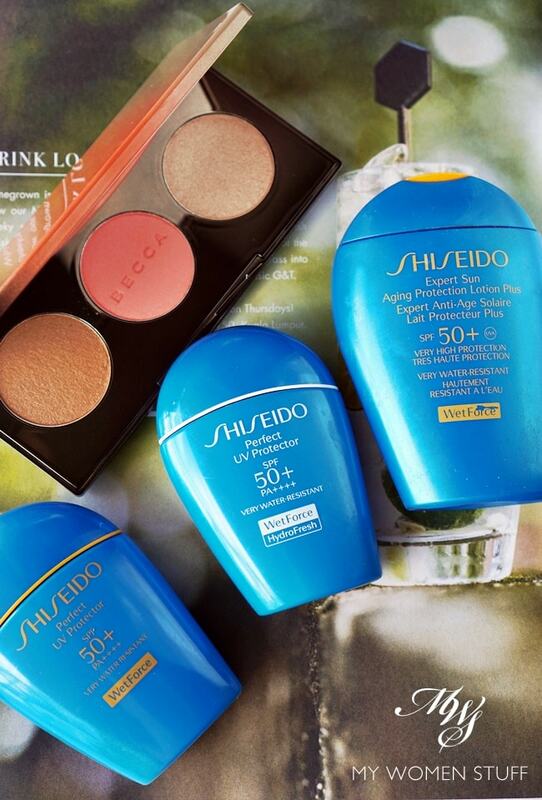 If you feel comfortable with SPF15 or SPF30, that’s your call. The difference therefore, lies in the formula and texture. The Shiseido Perfect UV Protector Hydrofresh has a rather creamier texture when squeezed out of the bottle. Because I use the same amount of sunscreen, whatever brand I use, this means that it goes on my skin a little thicker. But I persevere, because for me, that’s the best amount to use for each section of my face. It also goes on skin with a bit of a cooling feel that I find a little strange. I’ve gotten used to it by now, but the first time, it was weird. For your reference, this is how much sunscreen I use for each part of the face. It’s a lot. For me therefore, I find that the Shiseido Perfect UV Protector Hydrofresh does not feel as comfortable on my skin. Also, I find it a little more moisturising, but it does not boost any moisture levels in my skin. What it does is not make my skin feel dry. For this reason, I view the Shiseido Perfect UV Protector Hydrofresh to be better suited for someone with drier skin, not necessarily dehydrated skin (there’s a difference), or perhaps when cooler weather hits in the temperate countries. It helps add a layer of more moisture, for those who have trouble wearing certain foundations, for example. But for me, I don’t find it particularly comfortable, and I prefer the existing formula (bottle with the orange trim). The other reason I prefer the existing formula is because it makes a far better primer than this Hydrofresh version does. Like I said, if you have drier skin, the Hydrofresh will feel more comfortable, and makes a better base for makeup, or for drier or heavier foundation. But if you want a sunscreen and primer in one, you’d best go for the existing formula, as it has a light pink tint, that brightens the complexion a little as well. Perfect UV Protector Hydrofresh – You may notice that it has a more creamy formula that holds its shape when squeezed out of the bottle, as compared to the others. It is also white. I can’t tell if it will leave a white cast on someone with dark skin, as I can’t test that, so I will suggest testing it out at the counter first. Perfect UV Protector Wetforce – This is the existing formula, which is lighter and more runny as you can see. There is also a pink tint that brightens the complexion, and it makes a lovely primer. I do not find it to be particularly drying, but I have heard of people saying it is so. Expert Sun Aging Protection Lotion plus SPF50+ – This one is Made in France, and is not sold in Malaysia (or Asia, I believe) and is available in Europe. I personally like this texture best of the three. It has a slightly thicker texture compared to the Perfect UV Protector, but not as thick as the new Hydrofresh one. I wanted to show you the Shiseido Expert Sun Aging Protection Lotion Plus SPF50+ sunscreen, which I found online and tried. It is a beautifully large 100ml bottle, as it is meant to be used for both face and body. As I only use it for the face, it lasts a while. It too boasts Wetforce technology, and is water resistant and offers high protection against the sun’s aging rays. The difference is that this is Made in France, while the others are Made in Japan. I have to tell you that I really like the Expert Sun Aging Protection Lotion Plus. It has a lotion texture that feels very comfortable, comes in a value for money sized bottle, and my skin feels just as protected as it does with the Perfect UV Protector. Because I’m so generous with my use of sunscreen, this is really my favourite. I do try to buy it online whenever I can find it, and if I were in Europe, this would be the one I’d go for. But as I live in Asia, I will still stick by the Shiseido Perfect UV Protector SPF50+ PA++++. Hydrofresh will come in second. The new Shiseido Perfect UV Protector Hydrofresh sunscreen is an addition to the Shiseido Perfect UV Protector range of sunscreen. As the name implies, it is supposed to offer more hydration to the skin, and it has a thicker, creamier texture, that’s white, without the pink tint of the original version. I don’t mind it, but I prefer the original version because it feels better on my skin, and I find that it makes a better makeup primer as well. Also, the original version is a little bit cheaper, coming in at RM160 as opposed to the RM170 for the new version (as at July 2017). For those interested, this is the ingredient list for the Shiseido Perfect UV Protector Hydrofresh. Water, zinc oxide, ethanol, isododecane, ethylhexyl methoxycinnamate (octinoxate), caprylyl methicone, butylene glycol, bis-ethylhexyloxyphenol methoxyphenyl triazine (Tinosorb S), sucrose stearate, PEG-60 hydrogenated castor oil, dimethicone, silica, ethylhexyl triazone (Uvinul T 150), dextrin palmitate, xylitol, diethylhexyl succinate, menthol, menthyl lactate, nylon-12, PEG/PPG-14/7 dimethyl ether, thiotaurine, Saxifraga stolonifera extract, royal jelly extract (1), Sophora angustifolia root extract, PPG-17, isostearic acid, triethoxy capryllysilanedistearyl dimonium chloride, (dimethylacrylamide/sodium acryloyldimethyltaurate) crosspolymer , sorbitan sesquiisostearate, succinoglycan, cellulose gum, citric acid, butylated hydroxytoluene, tocopherol, trisodium EDTA, stearic acid, sodium pyrosulfite, sodium citrate, Syzygium jambos leaf extract, fragrance. Have you tried this new Hydrofresh version of my favourite sunscreen? PREVIOUS POST: Your Say: Do you go on a Digital Detox? Are you able to disconnect? NEXT POST: You Are Invited to the #MWS10 Luxury Makeup Party! SPF50 for me is the minimum as well! I’m interested to know (not sure if you have shared before), how many parts do you divide your face into that gets that amount of sunscreen? Actually, I use that amount on each part of my face. So, one finger’s length for my right cheek, repeat for my left, and about 1.5 of that for my forehead, nose and chin. It’s a lot, some people find, but I’ve gotten used to it. Ooooh! Thanks for the additional info on the lotion! Was checking it out on strawberrynet and based on your info, I think I’ll give it a go. Works out much cheaper especially with my “we miss you” discount! Haha I’ve been getting the We Miss You discount but not giving in yet! 😛 Yes you can get it there too and I really like it. Wish it was available here too. I remember Shiseido used to do a 100ml sunscreen for face and body, but not anymore. Hmmm. I love that it’s water resistant. Great for sports. I find my arms have tanned significantly even in winter because I run in a tank top and I skip sunscreen for the arms. Oops. My face remains the same because I still use an SPF 50 in winter. Yes, I use it when I go swimming and I think it helps. You can see the water beading and when I use on my arms, I sometimes have to use a cleansing oil to remove the sunscreen. But I am also like you, less diligent about my arms than I am about my face. Oops. Sifu Paris, is this the right amount needed for a complete coverage ? I use that for the entire face and find that I still get tanned – am I using too little ? How much is too much ? When it doesn’t get absorbed or it turns tacky ? Coz I also have primer and foundation so I’m worried I have too much on . Sunscreen last or after moisturiser ? Haha hardly a sifu, Angeline! 😀 They do say that the recommended amount is 1 tea spoon, which is A LOT. For me, this is a halfway mark that makes it more palatable. 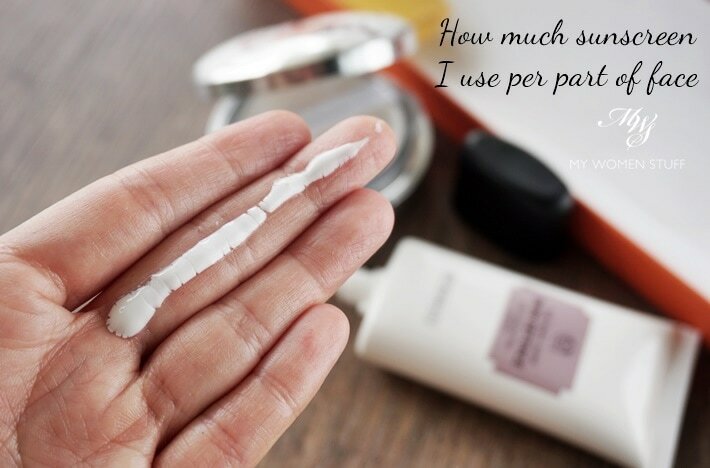 I’m not sure if you mean that you use this amount that I’ve shown all over, but I use it for each PART of my face. So, the finger’s length for my right cheek, repeat for left cheek and then 1.5 of it for forehead, nose and chin. For me, this is enough but for many, this is a lot. I guess it depends also on your skin and how much time you spend in the sun. SPF is supposed to be a measure of how long you can stay in the sun without burning. So, if you are very fair, then the time to be exposed to the sun will be shorter, and if darker, then longer exposure is possible. I try not to be exposed to the sun very much, when I can. And just like that – you ARE my sifu ! Lol – I’ll follow your steps then. I used to be a MUA for a big brand – but realised every other big name would like to create their own “menu” – the Koreans have a way, the Americans have a way – but we Malaysians juz seem to buta-buta do it – sometimes it boils down to practicality and our local climate needs. ? I use a lot of sunscreen on my face too, so I prefer the original one. I got a sample of the Hydrofresh, and found it a little too oily for my liking. I’ve been so curious about the face and body since I saw it online and I’m going to get it to try, since you said you like it. The Hydrofresh does feel heavy doesn’t it? I did try the tinted one too. A little conflicted about it because I can’t be sure whether to treat it as sunscreen or as makeup LOL! So the jury is still out on that! Oh gosh, I had meant the one for sensitive skin. My kids can’t use the tinted one. Lol! I have tried this sunscreen. It leaves a minty feeling on the skin. Do you apply it around the eyes? Yes, but not ON the eye area, if that’s what you’re wondering 🙂 I do notice the cooling feeling initially, but now I don’t notice it anymore. Maybe I’ve gotten used to it LOL! Do you like it? Can you recommend sunscreen for around the eye area? I find my eyes can’t stand the normal ones. They sting! Hmm that’s an interesting question, because I just use my regular sunscreen around the eye area (not on the eye) and I’m fine. Would a sensitive skin formula help? I know Shiseido does a sensitive skin formula. Or perhaps an eye cream that has SPF? Hi PB, thanks for your review on this sunscreen. The one I am using right now is the one for sensitive skin and children. It is mild to skin but it leaves an obvious white cast. Every morning, I can only blend my foundation on top of it. I feel you about the price hike. It feels like every time I buy a new bottle, the price has increased again. Sigh. I haven’t found anything more affordable I like, much to my dismay which is why I’m holding on. Is yours the one with the grey stripe? I haven’t tried that one, but I’m guessing the white cast is due to the zinc oxide, as that’s supposed to be less reactive. But I think I’m sensitive to zinc oxide (breaks me out) so I’m staying clear. You could dry blending a drop of foundation into the sunscreen. Might make your mornings go more quickly! I think there’s a lot of time before I can start using Shiseido as a sunscreen, right now I’m using one from Sunplay which it’s perfect for the heat but my dry areas were getting flakey so I started using a more hydrating moisturiser and the problem has been solved. About the tinted version, I think you should treat it as sunscreen unless you aren’t able to apply the same amount of sunscreen you’d use with another one. I’ve used some tinted sunscreen and I still use the same amount so I don’t compromise protection. Yes I have used Sunplay and I do find it drying but at least you’ve worked it out how to get around it! 😀 I am testing the tinted version of the Shiseido one and truthfully, it is a lot to use, if I were to use the same amount, coz the coverage is high. So I might resort to using it on top of sunscreen instead. LOL! But the jury is still out! But recently when I purchased a Bottle of the Original I think they have changed the Texture from very watery to some what Creamy , as I am a Guy I loved the watery One as it would seep into my beard area ( I am always clean shaven ) , with the Creamy I think its Heavier and tend to feel Heavy and makes a whitish patch on the beard area . Just wanna know if I am imagining this OR really the formula has been changed to a thicker consistency ? Pls enlighten me . Hello, I need some advice pls. I have the biore uv aqua rich watery essence spf 50+ pa++++ sunscreen which I am a little scared to used as I’ve heard it has a lot of alcohol in it. I also have the elta md spf40 zinc 9.0% octinoxate 7.5% and when I use this I find it makes my face feel lil itchy and uncomfortable. I live in the UK and 99% of the time I am indoors so I do not wear any spf, (should I still be wearing spf even if indoors?). Hi Soni, not an expert, but I’d wear sunscreen everyday, regardless of whether you are outdoors or indoors. UV rays seep in from anywhere, and can also be from lighting. So, I’d rather be safe than sorry. As for the Shiseido, if you have very dark skintone, there is a chance that there will be a cast on the skin. Most sunscreen that contain physical blockers e.g. zinc oxide and titanium dioxide tend to leave a cast. But if you can test it, or obtain a sample from the counter, that will be the best way to tell. Have u tried the new Shiseido perfect uv protector wet force WITH MULTI DEFENSE ?? Hey Mike, I unfortunately haven’t tried that one yet. I have quite a few bottles of sunscreen to go through yet, so I”ll probably get to it in due course 🙂 I have a feeling however that it is a reformulation of the Shiseido Perfect UV Protector (the regular one) so I’m hoping it won’t be too different because I love that one! This Shiseido “HYDROFRESH” SUNSCREEN is Not as good as the previous one as this makes the face look Duller and dark as opposed to the original perfect uv protector which made the face look Fresh and brilliant. Regret buying the HYDROFRESH . Sorry to hear that it didn’t work for you Mike. The regular (original) one has some pink pigment (very light) that helps make skin look brighter, which might explain why it makes the skin look fresher. This one doesn’t as it is a straight white. I don’t notice a cast, but perhaps it’s showing up on your skin hence the dull appearance. I want to know your views before I buy the new one. Hi, I care across your review while googling on sunscreen. I found a Shiseido Expert Sun Protection Lotion SPF 50+ Wetforce for Sensitive Skin & Children. Can I check if this is the same as what you have reviewed? Hi that isn’t the same as this one. The one for Sensitive Skin and Children (in the light blue bottle, I believe) has similar technology to the Wetforce (without Hydrofresh) but is more gentle without alcohol, fragrance and chemical sunscreen ingredients. I have not used that one.